The furore over the projection of horse racing on the Sydney Opera House raises not only the issue of the treatment of Louise Herron at the hand of a radio shock jock and her lack of support from the NSW Government, but also the broader issue of appropriation of public space for commercial purposes. The NSW Premier’s decision to allow advertising for a horse race to be projected on to the Sydney Opera House involves two issues. I will be speaking to [Premier] Gladys Berejiklian in about five to three minutes and if you can’t come to the party Louise you should lose your job. He has now apologized for his use of such language, but as Tim Costello points out in Pearls and Irritations, the incident illustrates once again the political power of the gambling industry in NSW. The other issue concerns outdoor advertising in general – be it for horse racing, banks, fast food chains or any other industry. Prime Minister Morrison put it plainly when he described the Opera House as the “biggest billboard” in the city, and suggested that the Sydney Harbour Bridge should also be used for advertising. Anyone opposed to such advertising he described as “precious”. If that is so, it would appear that more than a quarter of a million Australians who signed Mike Woodcock’s change.org petition are people of delicate sensibilities. But public anger is about far more than aesthetics or “good taste” as the Premier puts it. Rather, much of that concern is about the appropriation of our public assets and our public space for commercial purposes. As my colleague Miriam Lyons points out, it’s about present-day enclosure of the commons. Seventy-five years ago in his book The Great Transformation the Hungarian political philosopher Karl Polanyi warned about a social transformation where markets, which historically had been subject to society’s norms and rules, would come to dominate society. We would no longer be living in a society with markets bound in time and space (for example with limited shopping hours and defined commercial precincts), but we would be living in a “market society”. As in Orwell’s Nineteen Eighty-Fourwritten a few years later, there would be no such thing as private or common space. Just as Big Brother dominated all space in Orwell’s dystopia, so the market would dominate all space in the world Polanyi saw emerging. In Polanyi’s time commercial radio and television were just making their inroads into people’s homes. A little later the first commercial shopping malls were established: these were spaces we entered with the permission of Westfield or Stockland Property, rather than as free citizens using our publicly-owned sidewalks and parks. Similarly, billboards on our highways and advertising in our public transport have become more commonplace. Now we are seeing more electronic advertising – projections such as in the Opera House proposal and strongly backlit changing displays on freeway overpasses, in pedestrian precincts, air terminals and railway stations. Drivers on Sydney’s freeways can see several places where trees have been cleared to give better sightlines of electronic billboards. As Ogden Nash said “I think that I shall never see, a billboard lovely as a tree, indeed unless the billboards fall, I shall never see a tree at all”. For a graphic description of the brave new world of commercialized space, I commend JCDecaux’s Trends in Out of Home advertising. (Warning – frequently-changing bright images on that website may cause fatigue and stress.) Note the references to “captive consumer audiences” and to reaching “the entire urban population” – there is to be no choice, no escape. Just in the last two years 1400 digital billboards have been erected in Australia. Unsurprisingly it’s becoming harder to find spaces free of outdoor advertising. But, just as in Nineteen Eighty-Foursenior party officials were able to turn off the otherwise ubiquitous telescreen, so too can those with means and connections insulate themselves. You don’t find billboards along the streets of Point Piper, Toorak or Unley Park. The first class lounges at our airports are as free of advertisements as a Trappist monastery: the billboards in the airline terminals are for the economy-class passengers. Another refuge from outdoor advertising has been Canberra, but the last two years have seen an aggressive push by the Outdoor Media Association to allow billboards in the ACT, and initially the Territory Government seemed to be amenable to their approach, on the basis of the Association’s claims that outdoor advertising would “enliven” the national capital and provide it with “vibrancy” and “amenity”. In other words the claims of the Outdoor Media Association are bunkum. People dislike outdoor advertising. Perhaps some people’s dislike is on aesthetic grounds, and others are sensitive to the annoyance and distraction of a=outdoor advertising: there is already enough stress in commuting, by car or public transport, without the added assault of advertising. But both the Opera House case and the Canberra reaction point to a deeper resentment – a reaction against the commandeering of public space for commercial purposes: we want to live in a society, not a 24/7 ubiquitous market. In Canberra some compared it to the way vandals “tag” places to denote gang territory. 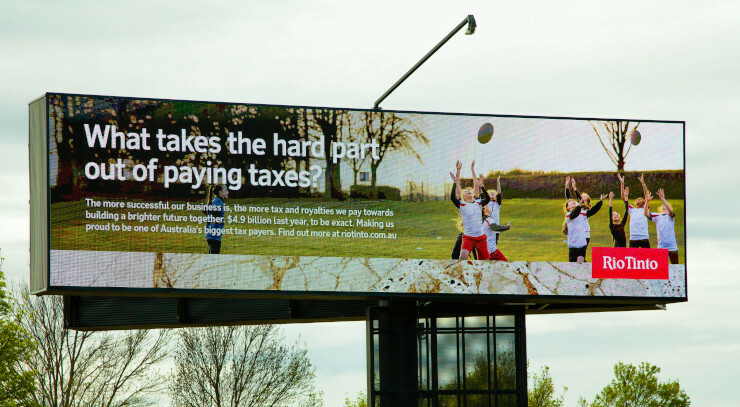 Public reaction hasn’t stopped the outdoor advertisers: In Canberra the owners of the privatised airport did a deal with the Coalition Commonwealth Government, to have Canberra’s advertising ban lifted for their newly-acquired land. On the perimeter of Canberra Airport are massive digitised billboards, erected in contemptuous defiance of demonstrated community standards. And the ACT government has been lax in enforcing its own laws on billboard advertising, as this web page shows. Governments can become sucked in to outdoor advertising by the revenue it brings in by way of license fees. But it is not some “free” gift. The $1 billion spent each year on outdoor advertising has to be covered by prices of goods and services. That’s about $100 per household – for the “benefit” of a visually polluted environment. Some types of advertising can provide useful information about new products and prices, but outdoor advertising is not informative: it is mainly in the form of brand-name reinforcement – a zero-sum competition in a parasitic industry. The main beneficiaries are the advertising firms themselves; only a trickle goes through to governments for the occasional park bench or WiFi hot spot. Outdoor advertising is a lousy way to raise public revenue. In some jurisdictions governments have taken the initiative to ban outdoor advertising, particularly in mainland Europe. Even in the US, renowned for “business friendly” regulation, billboards are banned in Hawaii, Alaska, Maine, and Vermont. It’s not only wealthy places than can afford to forgo revenue from advertisers: in Sao Paulo in Brazil, all outdoor advertising is banned. With elections looming federally and in our two largest states there are potential votes for any party that might propose to ban outdoor commercial advertising: the Opera House issue provides a great opportunity for aspiring politicians to take a stand. While Bill Shorten has stood up for those Australians who rightly say that the Opera House is not a billboard, the responses from the Coalition and from NSW Labor have been pathetic. What are they frightened of – Alan Jones, the gambling lobby or the outdoor advertising industry? Ian McAuley and his colleague Miriam Lyons cover the work of Karl Polanyi and the phenomenon of enclosure of the commons in their work Governomics: can we afford small government? Ian this was a great piece. I think you articulate what many of us feel. I avoid advertising as much as possible because I am so tired of the persistent, repetitive, insulting, bombardment of marketing “messages” on TV, radio, billboards, internet, junk mail, and public places including schools. It has reached such a sickening all pervasive pitch it feels like an assault on the senses, a force feeding of our minds to keep capitalism afloat, with no ability to fight back. Deface a billboard that offends or irritates you and see what happens! It is not only an imposed unwelcome pollution of our outdoor space, but most internal space too, especially our mental/emotional space and this is hardly ever an issue under discussion. I dumped my TV now the ABC is trashed. Unwatchable. Thanks, I thought it was just me felt like I was living in an increasingly commercial driven madhouse. I’ll read Polanyi. Thanks for that Ian. I am a Polanyi fan from away back but I had not made the connection with billboards. The gambling industry is the big influence here, methinks. How precious would Morrison be about advertising on his church, just another billboard? Of course, it wouldn’t be. Nor would the walls of Jones mansion.